Love phuchka but bored with the same old recipe? Welcome to Kolkata, where a young 20-year-old sells phuchka in twenty different varieties, uses mineral water and napkins, and gives one year of free phuchka to school toppers. Here’s presenting to you, Parkas Puchka and Pani Puri Stall! 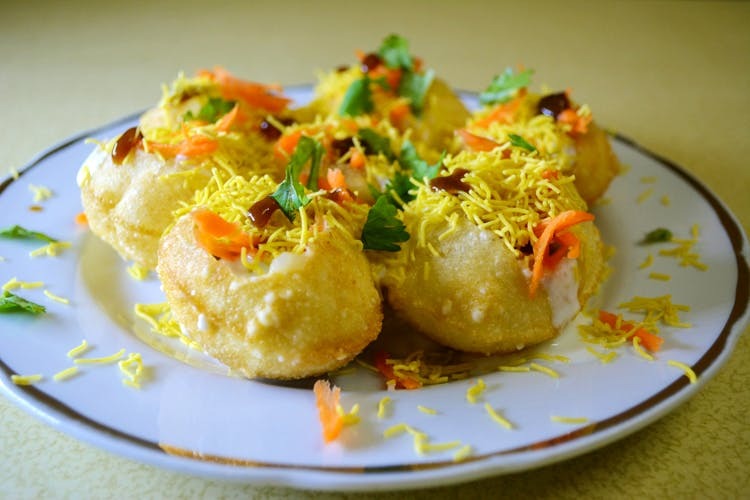 Right beside Alipore Garden Café, near Woodlands High building is Parkas Puchka and Pani Puri stall, a one-of-a-kind phuchkawala who has added twenty different twists to the usual phuchka and travelled to Bangkok and Singapore with his recipes. Meticulous about opening his stall everyday sharp at 3.10pm for four years now, he gathers a large crowd of phuchkalovers from all around town with his scrumptious phuchka spread! If you are an ardent phuchka-lover, the menu will leave you spoilt for choice! It has a mind-boggling and rather creative variety – ghugni phuchka, dahi phuchka, bullet phuchka, rocket phuchka, chocolate phuchka, badam phuchka, kissmiss phuchka… whew. We had a plate having one of each, because honestly, who could miss out on any of them? We recommend to not miss out on the one-of-a-kind chocolate phuchka, the badam and kissmiss (raisin) phuchka, and of course, the classic phuchka which comes with four different kinds of water! Who knew phuchka could blend so well with molten chocolate and badaam-kissmiss? We also loved the bullet phuchka, but fair warning, it is not for the spice-intolerant palate! If you love phuchka, and haven’t been to Parkas Puchka and Pani Puri Stall, it’s no less of a gastronomical blasphemy. Head over to Alipore Road right now and see for yourself what your favourite is from the twenty varieties on offer. What’s more, he is introducing ten more varieties soon! Somebody give him a Make In India award already.